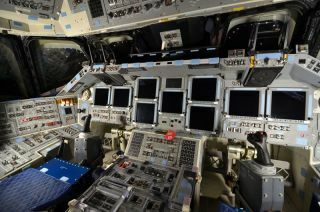 Endeavour's forward flight deck: commander's seat at left, pilot's at right. Both positions have manual flight controls, including rotation and translation hand controllers, rudder pedals and speed-brake controllers. NASA is set to begin delivering its retired space shuttles next month to museums for their public display. Out of the four orbiters to be moved — space shuttles Discovery, Atlantis, and Endeavour, as well as the prototype Enterprise — two are ready and waiting to be flown to their new homes in April, while the remaining two are now undergoing final preparations at NASA's Kennedy Space Center in Florida. On Friday (March 9), NASA parked Discovery inside Kennedy's 52-story Vehicle Assembly Building, where it will wait until mid-April for its ferry flight atop NASA's shuttle carrier aircraft, a modified Boeing 747, to the Smithsonian National Air and Space Museum's Steven F. Udvar-Hazy Center just outside Washington, D.C. It is at the Udvar-Hazy Center where the test orbiter Enterprise is now ready and waiting for its own flight on April 23 to New York City, where it will go on display at the Intrepid, Sea, Air and Space Museum. Nearby in OPF-2, Endeavour is being readied for it flight in mid-September to Los Angeles. The California Science Center will soon begin construction of an aircraft hangar to temporarily exhibit Endeavour while the museum's Air and Space Center is erected. The interim hangar will be located near downtown Los Angeles, northwest of the Science Center. Endeavour's underbelly (with deployed landing gear) is covered with more than 20,000 thermal protection system tiles that shielded the orbiter from the heat generated during reentry into the Earth's atmosphere. As it has done with the two other orbiters that flew in space, NASA is removing and saving parts from Endeavour's propulsion and maneuvering systems, either in an effort to make the shuttle safe for public interaction or to possibly be reused in support of the next generation Space Launch System. Endeavour, like its sister ships, will be outfitted with replica main engines, too. Other work still to be done on Endeavour includes the reinstallation of its orbital maneuvering engine pods, which were sent out to White Sands Space Harbor in New Mexico to be serviced for display; the removal of the pyro systems, which supported contingencies on the orbiter; and the extraction of three power-providing fuel cells to be serviced and returned. Only two of the fuel cells will be reinstalled. The third will be shipped separately to the California Science Center to be displayed near Endeavour. For similar reasons, the orbiter's food galley, waste collection system (toilet) and some of its mid-deck lockers will also be kept outside the vehicle for their separate exhibit. Endeavour will fly to Los Angeles with an empty payload bay. Its robotic arm, the Canadarm, is being returned to the Canadian Space Agency to be displayed at its headquarters in St. Hubert, Quebec. Endeavour's orbiter boom inspection system, a 50 foot extension to the robotic arm, was left at the International Space Station during its final mission in May 2011. As preparation work continues, NASA recently invited members of the media — including collectSPACE.com — to tour inside and around Endeavour. Click here to view photographs beginning at the nose of the orbiter and proceeding through its hatch onto the mid-deck and up on the flight deck. The photos then show the view under the orbiter and above the payload bay. The virtual tour ends at the aft of the vehicle with the openings for Endeavour's three main engines.